The Simplify Your Life Series has sold over 100,000 copies — Order Yours Now! Simplify Your Time is your personal 30 Day Time Makeover to gain control of your schedule and learn time-saving habits and strategies to create a lifestyle that allows you to get more done in less time. Featured in Office Depot Business section and purchased by Apple UK for their regional managers. Great for men & women. Simplify Your Space walks you room-by-room in your home to declutter and simplify in easy-to-follow sequences with diagrams, sidebars, and a 10 Question Checklist. The brilliant CALM organizing strategies help you maintain order and calm including how to prepare for a move. No more piles, just organized space! A 1-1 Coaching Sessions with Marcia Ramsland will quickly boost your progress with motivation, momentum, and mastery! This introductory Coaching Session will give you training and a step-by-step plan to get organized. Along with your copy of Simplify Your Life book, get the companion Workbook for any Simplify Your Life class or webinar to apply what you are learning with step-by-step application of every chapter. You’ll get organized for life! 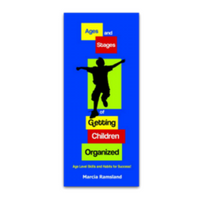 The Book Collection has all 8 Books and Booklets by Marcia Ramsland and will be THE “Go To” resources in your personal library. They cover everything from organizing your time, your paperwork, your home, and your life. Great for gifts, too! Marcia has Time Management tools she recommends and we are making the list available to you here. This will get you started if you are going to use a paper planner along with your digital calendar to keep track of daily details. Check out Marcia’s Favorite Products! “Ages & Stages of Getting Children Organized” birth through high school lays out age level chore chart, skills, and habits to guide your child to life success. Included is a memory book idea, a bedroom checklist, & guidance to teach age level skills. “Simplify Your Holiday Season” Turn seasonal stress into holiday success with this annual planning book! With an easy to follow system, step by step 8-Week, 4-Week, and 10 Day Plan, new celebration ideas, 50 Gift Giving Ideas, you’ll discover how to cover all your bases for Thanksgiving, Christmas, and New Year’s with ease! “Simply December Devotions” Prepare your heart and home with for Christmas December 1-25 with this purse size devotional page a day from the Christmas Story verse in sequence, an inspiring application for your day, a Holiday Tip a Day, and jot down personal reminders on the “Page a Day” Chart. Good for Family dinner time reading, too! Free Shipping. Now you can get BOTH Holiday books as a set! Pull these off your bookshelf annually to make “Simplify Your Holiday Season” planning book and “Simply December Devotions” purse size devotional will help you sail smoothly through the busiest time of the year! “The Ultimate Productivity Bundle” was created and curated by people with real life responsibilities just like you: they have families, work part- to full-time jobs or run businesses, don’t have personal assistants or the budget for hiring extra help. 46 products! Marcia’s 30 minute video training is exclusively included here on “How to Finish Your To Do List Every Day!” Email and let me know you ordered it & I’ll send you a free webinar how to best use the bundle. “Master Your Money Super Bundle” Getting control of your money can cut your stress, help you feel in control, and provide a safety net for unexpected expenses. You can count on real-life, money-saving strategies from people who know what it’s like to live in all levels of financial means. They want to help you pay off debt, budget like a boss, and reach your financial goals. Email and let me know you ordered it & I’ll send you a free webinar how to best use the bundle.